I got Diezel when he was 5 weeks old. I didn't want him. My then boyfriend insisted on getting him. 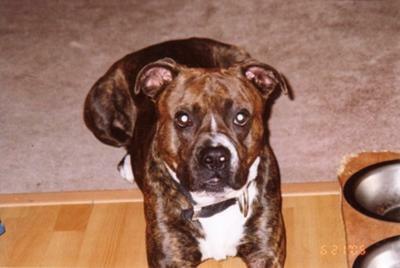 In the end, he was MY dog and he loved me unconditionally!!! 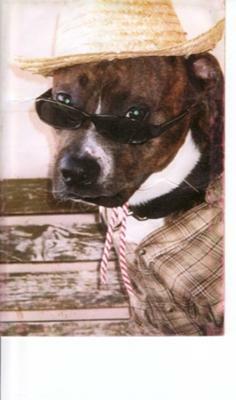 He LOVED to get dressed up and have "paparazzi time". He would actually pose for pictures. I just recently had to have him euthanized, and it was the saddest moment of my life. My life does not feel complete without my Diezel by my side. Please enjoy these pictures of him!! I totally know how you feel. My first Pit Liberty was a "gift" that in the beginning I was not excited about. She became my best friend and I loved her. I had to have her euthenized too when she was only 20 months old. It broke my heart and for 6 months a cried almost everyday. I had promised her, that I would rescue another pit bull from death row at the shelter, in her honor. Once, I did that, I found such peace and I saved a precious life. I still miss her but now I have 2 other rescued pits that needed me as much as I needed them. Best of luck to you and I'm sooooo sorry for your loss. Pretty dog, i really like that diezel and really like the comments about that, and its out look as well. Check http://www.trustessaywriting.com/blog/persuasive-essay-topics and share your feedback and positive comments as well, that will help us to improve its quality. Education is a building stone to future http://essaysmaster.com/ helps you to be a good human through writing essays.